Bangkok is an interesting city of contrast and intrigue – full of chaos and traffic jam, with a wide variety of people with varying lifestyles. But at the same time, it is also full of its charms and hidden gems, a popular tourist attraction that continues to dazzle and impress. Unearthing Asia takes on a tour of the city’s fine dining spots for your special night out on the town. 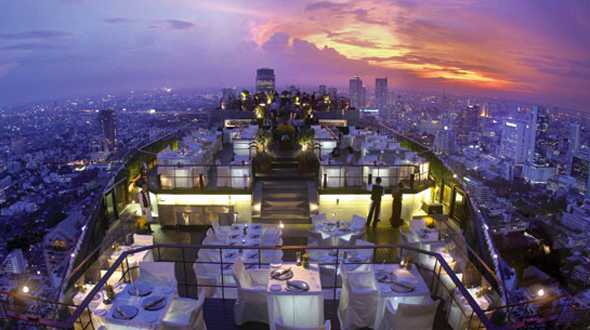 Beyond the blue horizon of Bangkok lies the Blue Sky restaurant, sited up top on the roof (24th floor) of Sofitel Centara Grand Hotel in Bangkok. The restaurant is a great open-air venue to enjoy a tasty dinner under the starry night sky, with a great 360 degree view of the bustling metropolitan city. Try out the tasty crowd favorites – Japanese Spring Rolls, Blue Sky Sibi and Lemon Tarts, amongst others. 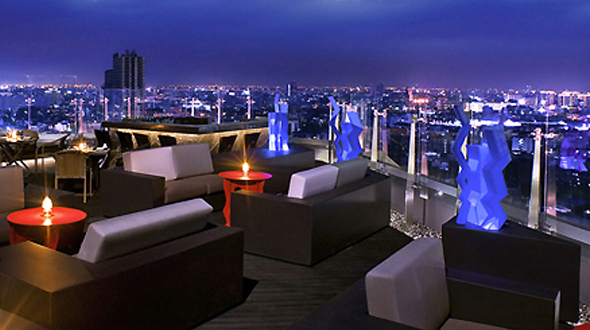 Be sure to check out the following guide if you are looking for even more amazing rooftop Bars in Bangkok. Located on the opposite bank from The Mandarin Oriental Hotel, this Thai restaurant comes with a great view overlooking the Chao Praya River. The atmosphere is excellent, with the twinkling lights of passing boats setting a romantic tone in the evening night sky. Every night there is also a traditional dance show that is worth checking out. But if you are forced to choose between a table with a view of the river or of the performance – my choice would be of the former. 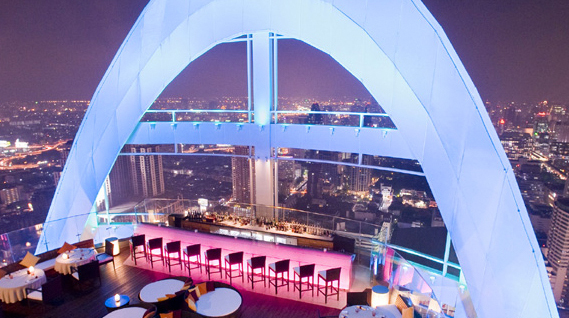 Vertigo and Moon Bar is one of the highest al-fresco bars in the Asia Pacific, and a must-visit destination on every Bangkok travel itinerary. Located some 61 floors above the streets of Bangkok, at the top of the Banyan Tree Bangkok, this open-air rooftop lounge truly lives up to its name, offering views that simply take your breath away. There’s no better place for a romantic rendezvous, lounging after work or a glamorous launch party. 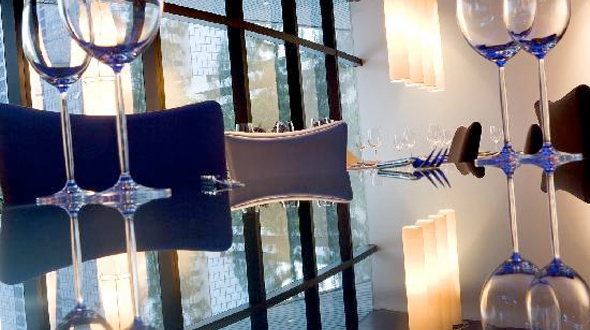 Flava Restaurant & Lounge is a chic and stylish restaurant located in the Dream Hotel Bangkok. Set above the lobby, Flava blends modern design and ancient tradition in appealing fashion. Savor the creative gourmet fusion of Western and Asian fare while taking in the Bangkok street scene in a lush, comfy surrounding. 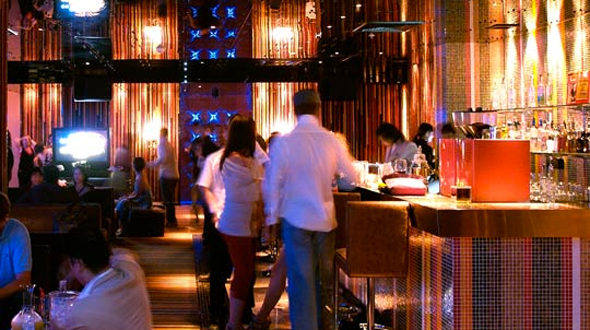 An evening at Flava is sure to be filled with exotic ambiance and lush atmosphere. This ultra-hip spot is one of the newer addition at the State Tower, home to some of Bangkok’s priciest restaurant. 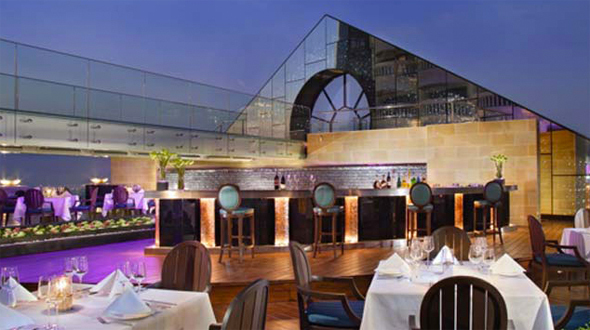 The open air concept on 52nd floor serves a mix of pan-Asian cuisines that embraces the pinnacle of perfection. 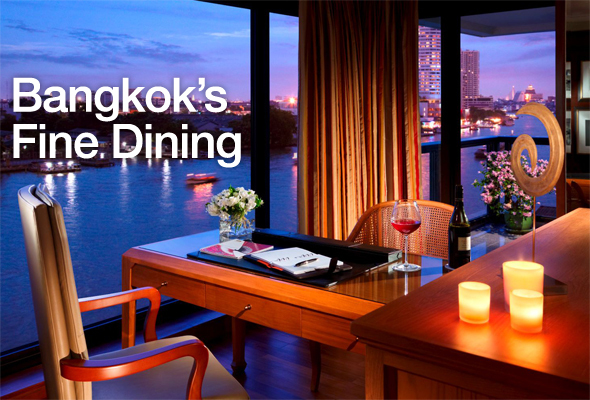 At night the restaurant is aglow with purplish glow, complementing the extraordinary bird’s eye view of Bangkok which you can choose to admire from the al-fresco terrace or from the spectacular glass-sky bridge suspended in mid-air. Crowning the stylish Centara Grand at CentralWorld, the Red Sky Bistro is a chic urban concept with a modern, delectable approach to old world dining. Set at the top 55th floor, the bistro comes with stunning city views and artfully arranged wind-protection to ensure the dining comfort of guests. The menu is not extensive but satisfactory, with a methodical care at preparing a five-star meal for you. The real star however, is the extensive Wine List, which offers you a perfect companion to savor the beautiful night sky. Located at the Shangri-La Hotel by the Chao Praya River, this restaurant’s atmosphere is perfect to set the tone for a romantic evening. 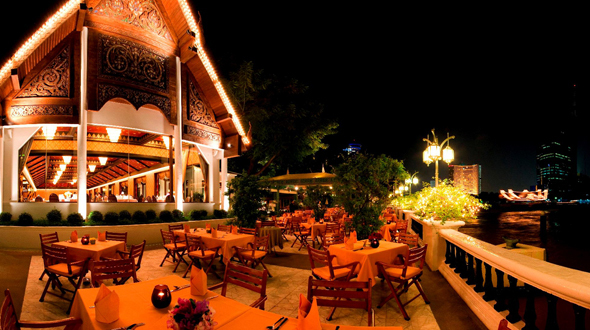 Enjoy a sumptuous Thai dinner as you enjoy the passing boats lighting up the river. Live traditional music and dance accompanies your meal, and if you are lucky you may even catch some fireworks over the river. This award-winning restaurant offers modern French cuisine with intense flavors at Level 3 at The Plaza Athenee Bangkok. The atmosphere is cozy and delightful, with an extensive wine list to complement the innovative and intriguing menu created by Chef Thibault Chiumenti. Old black and white movies are played in the background to add a touch of classic flair into the decor, all in all a complete package! Located in the heart of Bangkok’s downtown Business District between Silom and Sathorn, the Opus Wine Bar is an Italian restaurant with a classic ambiance. The atmosphere is cozy, with tables spread out nicely for guests to enjoy their own space, and the food features a wide range of Antipasti and Tapas ideal for sharing, as well as home-made pastas, fresh fish and grilled meats. 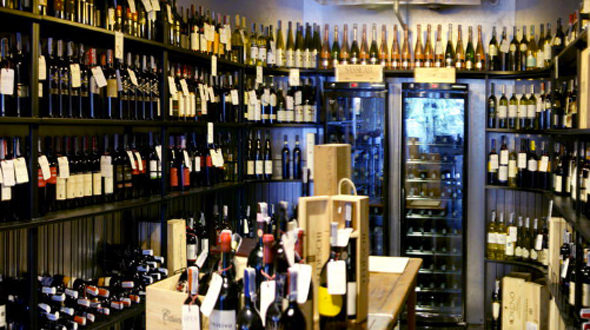 The highlight of the restaurant however, is without a doubt the extensive walk-in wine cellar which offer guests a selection of over 400 labels – probably the widest selection of Italian wines in Bangkok.